Buy 3 or more, receive free shipping! Use coupon code freeshipping at checkout! Cowboy Benny Lee from the James Little Band really enjoys this spice on just about everything. Thank you for the gift for the band. This spice is amazing! My family loves it on chicken, pork and beef!! hes staying here at the Hampton Inn, a hotel I work at and he just gave all the front desk girls a bottle!!! cant wait to use it!!!!! I’ve tried Diamond Dales Spice & Rub on sirloin, chicken, salmon, and even some pad thai with lemon. This seasoning is incredibly versatile with just the right amount of heat. You can really choose how spicy 🌶 you want things to be. I also come from a family with a history of heart disease, so the lack of sodium is a real benefit in my opinion. I foresee this being a long term staple in my kitchen. Best spice out there!! I use it on everything I cook!! 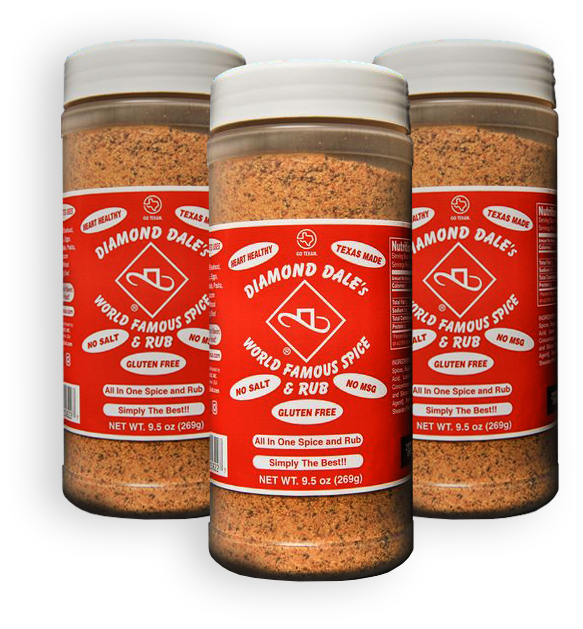 Diamond Dale's World Famous Spice and Rub is a heart-healthy choice to add flavor to anything! It is sodium free, no MSG, gluten-free. Its wide use comes from its simple ingredients: garlic, onion, Cayenne, Rosemary, lemon powder, and Dale's secret spices. This all-in-one spice and rub can be used traditionally on beef, poultry, pork, and on beans, eggs, pasta, and even beer! Our product is NON-IRRADIATED. Apply light for flavor and heavy for heat! Join our facebook page for recipes from other customers. Contact Dale and the team! Welcome to our Newly Redone Page. Diamond Dale's World Famous Spice and Rub will be the last spice and dry rub you will ever have to buy! Heart Healthy, All-In-One, and Texas made. ZERO Salt, No MSG, Gluten Free. This means you will save time, money, and cabinet space with the perfect flavor every time! Due to the fact that I am a former U.S. Army Veteran myself, I personally support the Wounded Warrior Project. We are proud supporters of the Wounded Warrior Project. The ingredients were carefully chosen so the final product was Heart Healthy Texas Made Spice with ZERO Salt, No MSG, and Gluten Free. Most food already contains a sufficient amount of salt and meat with fat on it will also gain a salty taste as the fat cooks. Too much salt can dry out your meat and make it tough which is NOT how you win competitions. The ingredients were carefully chosen so the end product is versatile. Diamond Dale's World Famous Spice and Rub is great on EVERYTHING and can be applied light for flavor, heavy for heat. Diamond Dale's World Famous Spice and Rub is the perfect all in one product. Heart-healthy, no salt, no msg, gluten-free, and Texas made! Apply light for flavor, heavy for heat! © 2018 Diamond Dale's World Famous Spice & Rub. All Rights Reserved.